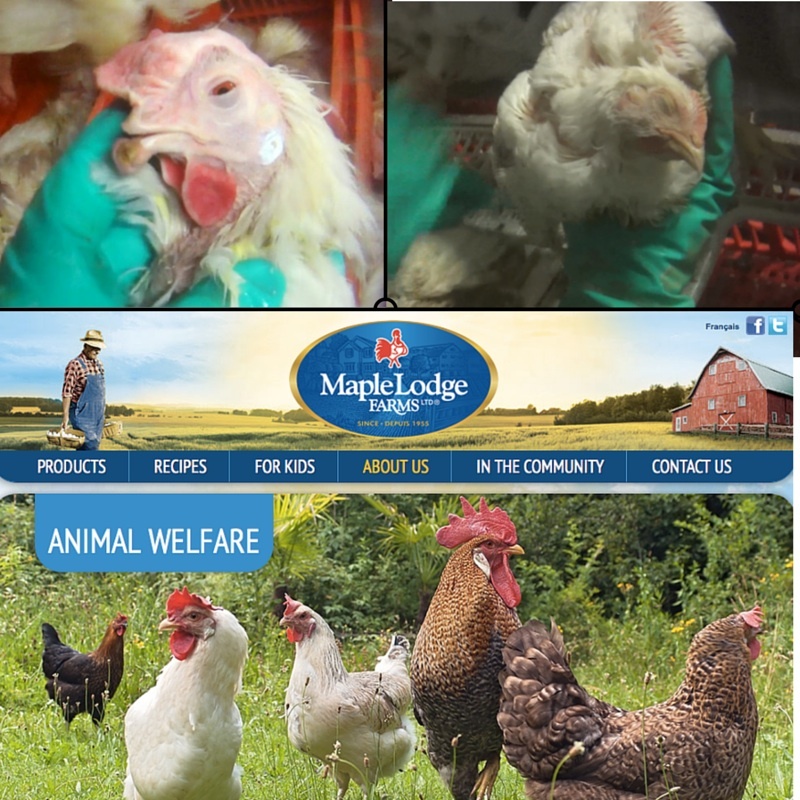 TORONTO – Animal Justice Canada Legislative Fund—a national non-profit animal law organization—has filed a formal legal complaint against Maple Lodge Farms, citing violations of federal consumer protection laws. The complaint follows a hidden-camera investigation revealing disturbing and potentially illegal treatment of chickens under the care of Maple Lodge. Through numerous written claims, Maple Lodge advertises itself as family farmers deeply committed to the “humane and respectful” treatment of chickens, stating that it complies with industry codes of practice. It also uses visual imagery of outdoor pasture and small-scale farming. In reality, the treatment of chickens at Maple Lodge has been called “unconscionable,” “inexcusable,” and “abhorrent” by animal welfare experts. Maple Lodge operates no farms, and the half-million chickens it slaughters each working day will virtually never have seen the light of day. It was convicted of 20 animal cruelty charges in 2013 and is currently on probation, and since its convictions has been issued at least 14 additional fines for animal cruelty violations. Federal law prohibits making “false and misleading” claims in advertising. The Consumer Packaging and Labelling Act and the Food and Drug Regulations are designed to protect consumers from being deceived, while the Competition Act also ensures the fair and efficient functioning of a competitive marketplace. This is the first major consumer protection complaint in Canada against a meat producer for misleading humane claims. Meanwhile, similar complaints in countries like the U.S., Australia and New Zealand have led to a crackdown on claims made by the agricultural industry, resulting in huge court fines and industry reform. In 2014, the enormously popular vegetarian meat alternatives company Field Roast was prohibited from selling its products in Canada based on technical, outdated provisions of the very same statute—the Food and Drug Regulations—of which Maple Lodge appears to be in current violation. To download the legal complaint, click here. To view the undercover footage from Maple Lodge, please visit: www.MapleLodgeHarms.ca.